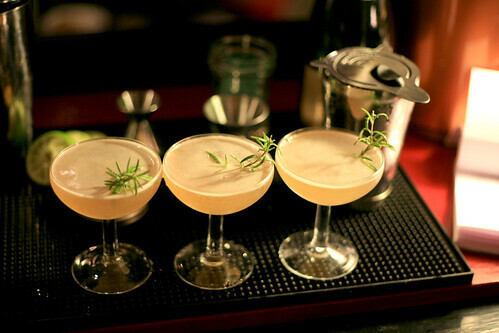 A delicious mix of pear lime and rosemary. The drink is fantastic; the lime balances out the pear which can be quite overwhelming sometimes. The rosemary is fairly understated and mostly at the front of the palate… partly because of the aromatics from the garnish, but also because the drink is light on the syrup. If you crank up the syrup it starts to taste a little too savory. Shake all ingredients except for champagne with ice and strain into a chilled cocktail glass. Top off glass with sparkling wine and garnish with a rosemary sprig. Bring sugar and water and rosemary to a boil in a medium sauce pan while stirring. remove from heat when sugar is completely dissolved. Let the mixture cool and strain out the rosemary and store in the refrigerator. This entry was posted on Saturday, January 3rd, 2009 at 7:59 pm	and is filed under Cocktails, Infusions, Recipes. You can follow any responses to this entry through the RSS 2.0 feed. Both comments and pings are currently closed.